This quarter will be difficult to compare to other periods, but the report sets the stage for a new era in the mixed-signal chipmaker's history. This car is controlled by NXP chips, and so is the car. That's also how they communicate. Photo: NXP. NXP Semiconductors (NASDAQ: NXPI) will report fourth-quarter results on Wednesday evening after the close of extended trading. The Netherlands-based company reports so late that the customary conference call with analysts will fall on Thursday morning for us Americans. This will be a transitional report, since NXP closed a $40 billion merger with Freescale Semiconductor in early December. So the reported period will include two months of stand-alone NXP results, and one month of NXP-plus-Freescale operations. Expect a plethora of non-GAAP adjustments. For example, the merger had not yet closed three months ago, and the timing was still up in the air. Therefore, management's guidance for the quarter only included the classic NXP business, making no room for Freescale's incoming sales and profits. That said, NXP expected all five of its reportable divisions to see revenues falling by double-digit percentages compared to the third quarter. This used to be a standard seasonal pattern back in the day, with double-digit sales drops in the fourth quarters of 2011 and 2012, but the year-ending period delivered sequential sales growth in 2013 and 2014. Adjusted gross margins are expected to hold steady at roughly 49%, and non-GAAP operating expenses should rise by a couple of percent. And that's all the guidance NXP would provide this time, given the unpredictable nature of the then-pending Freescale merger. Moreover, NXP has been treading water lately. Demand for its near-field communications and secure interfaces products has been soft in recent quarters, and management expected more of the same in this period. And where design wins are happening, such as in the general-purpose microcontroller market, the agreements are leading to reportable sales at a slower pace than usual. Many of these sluggish contracts are happening in China. The Freescale deal is very much a merger of equals. Together, they should see annual sales north of $10 billion; NXP's annual sales are currently at a run rate of $6 billion. 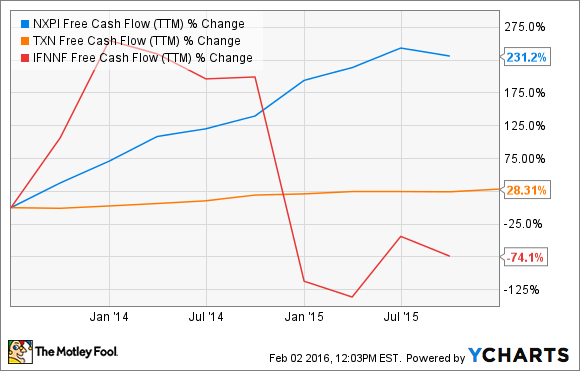 NXPI Free Cash Flow (TTM) data by YCharts. These trends may change dramatically with Freescale on board. This report will give NXP's management a chance to set the scales for future expectations, and rebalance how the company compares to its peers. Keep your favorite analog and mixed-signal semiconductor specialists in mind as you digest Wednesday's results from NXP.